About 420 million years ago, during the Silurian Period, ancient plants and arthropods began to occupy the land. Over the millions of years that followed, these land colonizers developed and adapted to their new habitat. The first forests were dominated by giant horsetails, club mosses, and ferns that stood up to 40 feet tall. Life on Earth continued to evolve, and in the late Paleozoic, gymnosperms appeared. By the Triassic Period (245-208 mya), gymnosperms dominated the Earth's forests. In the Cretaceous Period (144-65m mya), the first flowering plants (angiosperms) appeared. They evolved together with insects, birds, and mammals and radiated rapidly, dominating the landscape by the end of the Period. The landscape changed again during the Pleistocene Ice Ages-the surface of the planet that had been dominated by tropical forests for millions of years changed, and temperate forests spread in the Northern Hemisphere. * Temperature varies from -30° C to 30° C.
* Precipitation (75-150 cm) is distributed evenly throughout the year. * Soil is fertile, enriched with decaying litter. * Canopy is moderately dense and allows light to penetrate, resulting in well-developed and richly diversified understory vegetation and stratification of animals. * Flora is characterized by 3-4 tree species per square kilometer. Trees are distinguished by broad leaves that are lost annually and include such species as oak, hickory, beech, hemlock, maple, basswood, cottonwood, elm, willow, and spring-flowering herbs. * Fauna is represented by squirrels, rabbits, skunks, birds, deer, mountain lion, bobcat, timber wolf, fox, and black bear. Notice the dark trunks of the evergreens, the tallest trees in this ecosystem. Notice the fragile shorter trees: these are vine maples that grow in the shade of the evergreens. The forest floor is covered by ferns, mosses, and small plants. Mosses and lichens grow on the tree trunks and rocks. Temperate rain forests are found on the western edge of North and South America, where moist air from the Pacific Ocean drops between 60 and 200 inches of rain a year. Unlike the tropical rain forest, the temporate rain forest has seasonal varition, with summer temperatures rising to about 80 degrees Fahrenheit and winter temperatures dropping to near freezing. In the northernmost regions, winter may be cold enough for some ice and snow. When these trees are full grown, they are between 130 to 280 feet tall. In some areas other conifers dominate. For example, in California redwood trees grow in the temperate rain forest. Small shade-loving trees, such as dogwoods and vine maples, form the understory level. Beneath the trees, shrubs such as wild currants, thimbleberries, and huckleberries grow in the filtered sunlight. Sword ferns, salal, and Oregan grape plants also thrive here. At the ground level, the earth is littered with dead fir needles, leaves, twigs, and fallen trees. These lie on and under a thick carpet of mosses, lichens, grasses, and small plants, such as Oregon oxalis (which has leaves like a shamrock). The rocks are green with moss, and the tree trunks and branches are covered with moss and algae. These low-growing plants are shade tolerant. Here and there one may find toadstools, mushrooms, and other kinds of fungi: these saprophites (organisms that digest dead organic matter) help to recycle the dead material on the forest floor. This forest has nutrient-rich soil because there is a lot of dead organic matter on the ground. This dead material is being slowly digested by the fungi, insects, and bacteria that live here. In the tropical forests the trees have to spend some of their energy drawing up water and getting rid of heat: in this milder climate the trees can grow and grow. Scientists say that there is more biomass in this biome than in any other biome on earth. There may be 500 tons of living things per acre here! That translates down to about 206 pounds per square yard, about the same as one good sized human adult per square yard! 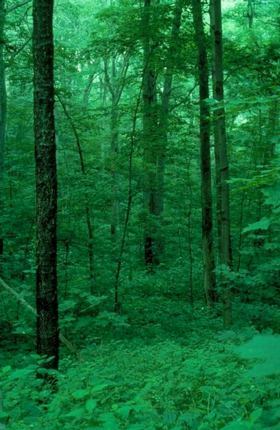 Most of the animals in this forest live on or near the ground, where there is lots of food, and the trees provide shelter from sun, wind, and rain. Beetles burrow in the moss and hide in the bark of trees. Wood peckers and birds eat the insects. Grass is eaten by the voles (cute little mouse-like animals) and the deer. There is food that is easier to eat than the tough needles of the conifers. However, the conifers do provide food when they make their nourishing seeds. Birds and small animals eat these seeds. This biome has seasonal variations. Although temperatures remain mild, animals and plants respond to the seasons in their growth and reproductive patterns. Spring brings new life as animals are born and eggs hatch. Summer is a season of growth. Fall brings maturation and preparation for winter. Winter is a season of rest and endurance. The Primary Producers of this forest are the plants that use their chlorophyll to create food for their own growth as well for the animals. The Ground Layer of this forest is covered with green mosses and small plants. Mushrooms, grasses, and wild flowers grow among the mosses, covering the ground with a thick, moist, green carpet. Dead leaves, logs, needles, and twigs, provide food for the detritivores, who digest the dead materials and make them available for recycling. In this forest the soil is rich in nutrients. The Understory Layer is made up of shrubs and small trees. Many of the shrubs are deciduous and shed their leaves in the fall. Many of them, such as huckleberries and blackberries, also have small, sweet fruits and berries. The canopy layer of this forest is made up of magnificient coniferous trees. They produce edible seeds and provide a thick "roof" over the smaller trees. Their branches and trunks support blankets of moss. The vegetation is so thick that sometimes when snow falls it is caught by leaves and twigs so that it does not fall down to the ground. The Primary Consumers are mostly small animals. The forest provides food, shelter in the moss, mild temperatures and humidity, which encourages the growth of many kinds of insects. It is a paradise for mosquitoes! As well as insects, there are small mammals: voles (tiny mammals like mice), chipmunks, squirrels, and seed eating birds. These eat seeds, grasses, and even mushrooms. Larger animals, such as deer and elk, also find food in this biome. An interesting primary consumer is the salmon. These fishes hatch from eggs in the cold mountain streams and eat tiny water organisms and insects that fall into the water. The young fish swim down the river to the ocean, where they grow to maturity. When they are fully grown, the large fishes return from the ocean and swim upstream to lay their eggs. Then the parents die, and their bodies provide food for all the meat eaters in the area. Secondary Consumers are also at home on the forest floor. Tiny shrews devour the insects, and frogs catch insects as they fly by. There are many insect-eating birds as well, some of which, like the woodpecker, are adapted to finding insects in the trees. Weasels eat small animals, and racoons eat animals, fishes, frogs, and fruit. Owls eat voles and chipmunks. Insects live as parasites on other animals. Large secondary consumers, such as wolves, bears, and cougars, are the only ones who can bring down deer or elk. However, once they have made a kill, smaller carnivores may move in to get a share. The larger carnivores may also eat smaller ones sometimes. There are other animals in this food web, such as foxes, beavers, black birds, and porcupines. Because the plants do so well, animals flourish too. For millennia, temperate forests have suffered the onslaught of logging, burning and clearing for wood products, pasture lands and cities. Almost all of the native hardwood forests of Europe, the eastern U.S. and central and eastern Canada have disappeared. Finland and Sweden have only tiny patches of oldgrowth forest left. Less than one percent of British Columbia's magnificent coastal old growth Douglas fir forests remain. Most of the native forests in south central Chile are gone. The replacement of forests by farms and cities is an obvious form of deforestation. More insidious, but every bit as ecologically destructive, are the current forest practices that replace native forests with plantations(monocultures of single tree species planted by humans) and commercial tree farms (managed "forests" that are thinned, tended with biocides and clearcut on short rotations to achieve optimum fibre yields for industry). Plantations now cover over 13 million ha in northern Europe, 11 million ha in North America, 17 million ha in Russia and Eastern Europe, and 1.7 million ha in Chile. Tree farms and forest plantations are ecological abominations. They are wrested from native forests through clearcutting - the complete removal of all trees and associated vegetation over a large area of land. Clearcutting and its associated logging roads cause soil crosion, water degradation, and loss of biodiversity. In Sweden, for example, where oldgrowth forests have largely been replaced by plantations of Canadian lodgepole pine, the loss of biodiversity has reached disastrous levels. Over 40 vertebrate and 50 plant species are seriously endangered, and another 220 species are threatened with extinction. In British Columbia (B.C. ), Canada, where clearcutting and conversion of ancient forests to managed tree farms occur in more than 90 percent of the harvested forests, 24 species dependent upon oldgrowth forests are now at risk of extinction. In 1992, a government audit of randomly-selected logging sites on Vancouver Island showed that almost two-thirds of streams were negatively affected by logging and one-third suffered complete salmon habitat loss. In Chile, where native forests are being clearcut, burned, highgraded and converted to exotic tree plantations on a massive scale, 6 plant species are almost extinct, 11 tree species are now endangered and a further 26 tree species are classified as vulnerable. Many wildlife species are also at risk of extinction as a direct result of the destruction of their forest habitats, including the Huemul, Pudú, Guiña cat, Chilote fox, Comadrejita Trompuda, Black Woodpecker, and Darwin Ranita. The similarities between forest practices in Chile and B.C. are strong. Chile and British Columbia are both at a crossroads. They still harbour a variety of oldgrowth temperate forests, including Earth's largest remaining tracts of extremely rare, biomass-rich, ancient temperate rainforest. But both governments currently allow forestry practices that are destroying, at a rapid rate, the last of these unprotected ancient forest ecosystems. In order to prevent the loss of biodiversity and achieve truly sustainable forestry, major changes in forest practices must occur. Hope lies in adopting ecologically sustainable forest practices that many people are calling "eco-forestry". Eco-forestry is a low-impact method of forestry based on selection harvest of trees at a slow enough rate to allow native forests to sustain themselves through natural regrowth. Eco-forestry does not highgrade or degrade the forest. It retains wildlife trees along with the diverse ages and species of trees found in native forests. Eco-forestry is based on the understanding that nature knows best how to manage forests, and humans must take the "interest" not destroy the "capital" of the natural forest ecosystem. To complement the ecologically managed forests, areas of unaltered native forests must also be preserved, so that we can better learn how native forests function. Only through increased preservation and a switch to eco-forestry practices that sustain the structure, functions and biodiversity of native forests, can we hope to save Earth's native temperate forests.